Sunday, August 18, Teotitlan del Valle: I’m behind the wheel of the aging blue Toyota truck, four on the floor. Cindy climbs in next to me riding shotgun. Eric, Sue and Emma hoist themselves onto the flatbed and we set off up the cobblestone street, bumpety bump, for the house where they cultivate silkworms, cook the cocoons into silk, spin it, and weave it into glorious rebozos, huipils, camisas (shawls, blouses and shirts). “Tope”, Sue shouts as we approach a speed bump. It is impossible to go faster than 10 mph anywhere in the village. There is a Tope every block or two. Reynoldo Sosa and his wife are the proprietors of Arte y Seda. They feed their caterpillars mulberry leaves from the trees that grow in their courtyard. The silk is spun and woven into beautifully soft material, which is then dyed with cochineal, pericone, indigo or the leaves of pecan trees. They only use natural dyes. 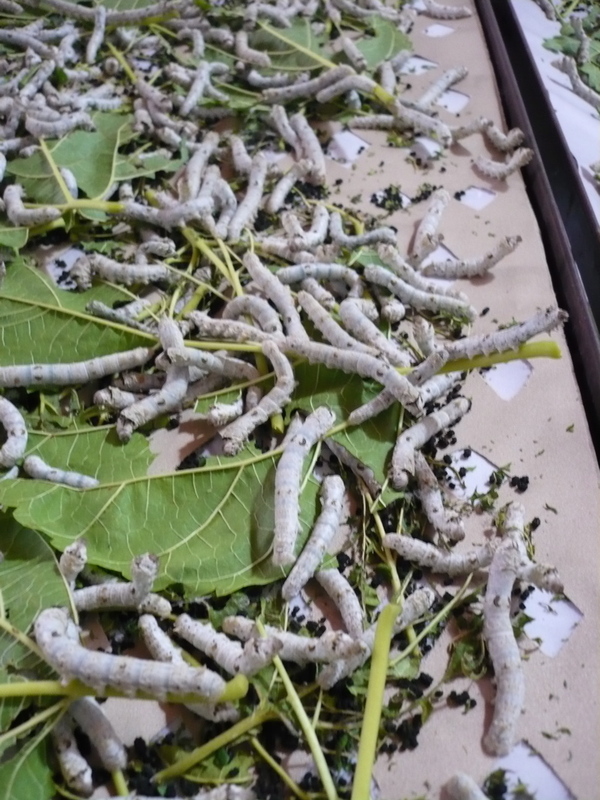 She told us that her father was cultivating the silkworms, and they learned the process from him. Years ago, in the early 1900’s, the use of pesticides in the village wiped out the silkworms and the family had to start all over. This is a labor-intensive process. 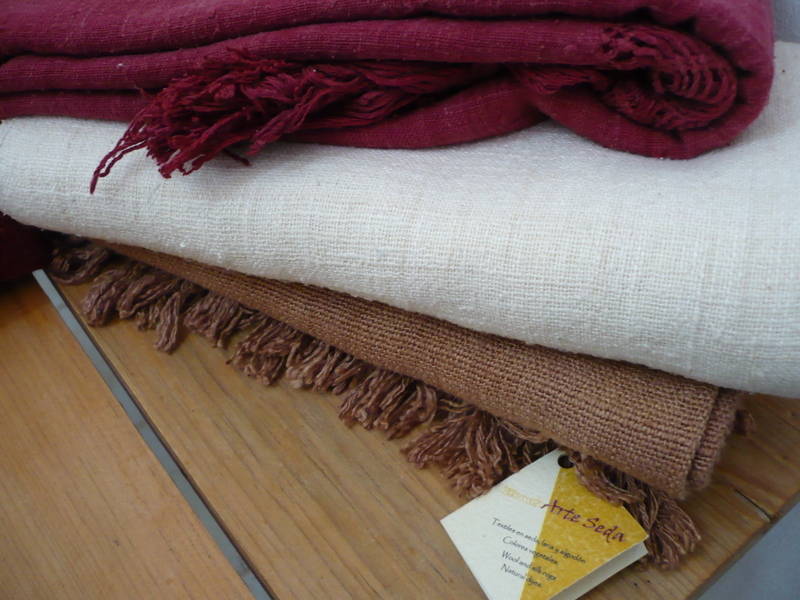 Just like everything else that is handmade in the Oaxaca valley. 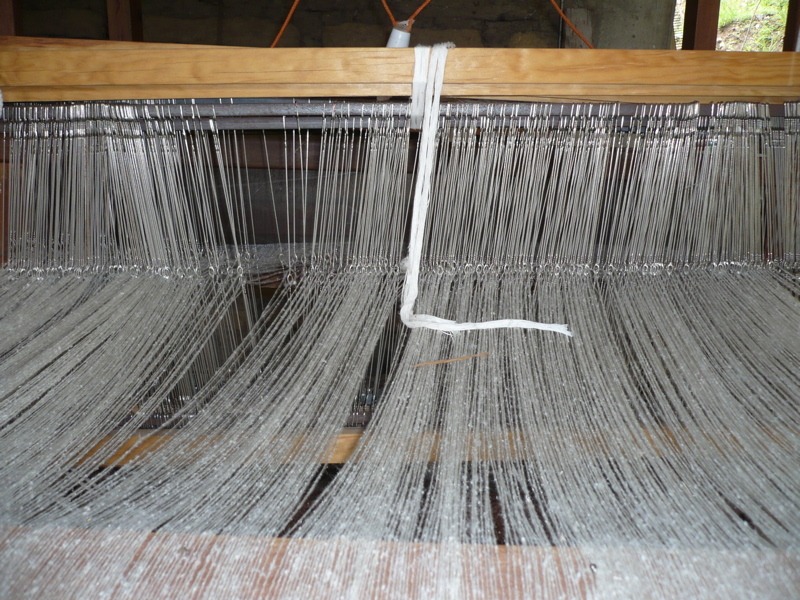 Notice that the loom is dressed (warped) by hand, with all those fine strands of silk that are looped through tiny eyes. 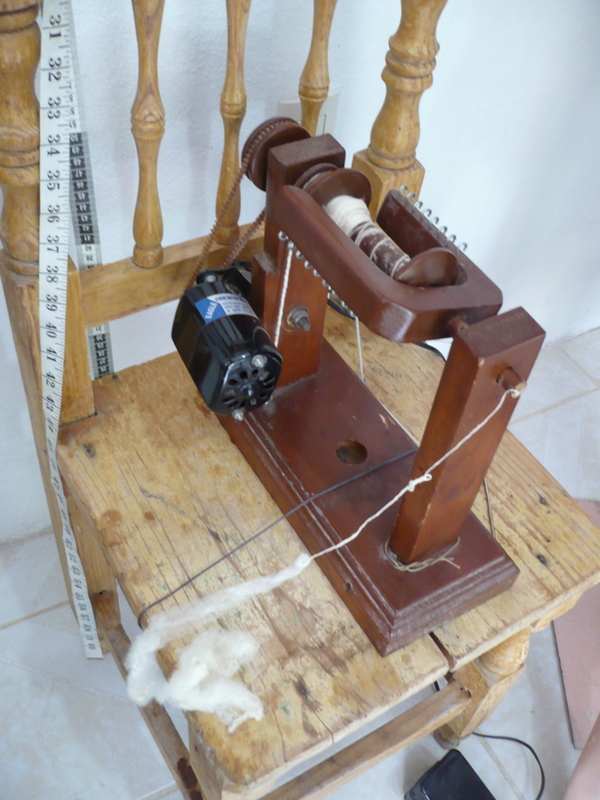 Then, when it is cut off the loom, it is sewn into a garment, or finished off by a macrame or crochet process that makes a beautifully intricate and secure fringe. Amazing! This entry was posted in Clothing Design, Cultural Commentary, Oaxaca Mexico art and culture, Oaxaca rug weaving and natural dyes, Oaxaca travel, Teotitlan del Valle, Travel & Tourism and tagged Arte y Seda, Mexico silk, natural dyes, silk and natural dyes, silk blouses, silk huipil, silk scarves, silk textiles, silk weaving Oaxaca, silkworms, Teotitlan, weaving and natural dyes. Bookmark the permalink. Hi Does one go through the village of Teotitlan and where the village ends one can find Arte y Seda? Is there no street name or house number? Susanne, the main street through Teotitlan del Valle is Avenida Benito Juarez. Continue on this street toward the mountains. At the top of the hill close to the dam, is the house for Arte y Seda. There is a large sign above the gateway. You cannot miss it. The street name is Avenida Benito Juarez. I do not know the house number. You can contact Arte y Seda in Teotitlan del Valle, they are at the end of Avenida Benito Juarez on on the outskirts of Teotitlan on the road toward the mountain village of Benito Juarez. I don’t know if they sell the silk fibers, but you can ask them! There is also a silk weaving village, San Pedro Cojones (I think this is the spelling) in the mountains about 2 hours from Oaxaca. Hi, Jim. Arte y Seda is located on Avenida Benito Juarez, on the right side of the road heading out of the village northwest toward Benito Juarez and the presa (dam). Continue on after the paved road ends. The family are relatives of the people who are in the Bii Dauu cooperativa. 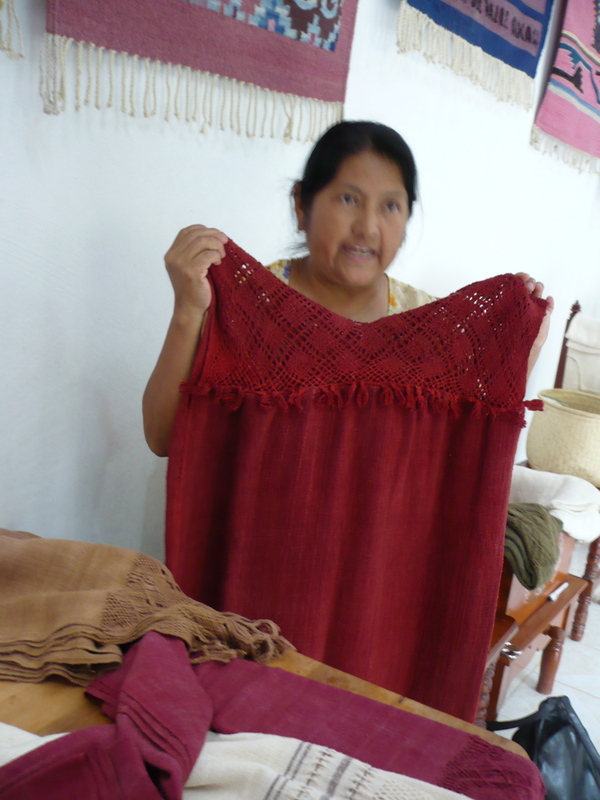 The existence of silk textiles in Teotitlán del Valle is a nice surprise. Please tell me how to find Arte y Sede .